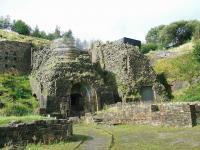 Blaenavon town owes its existence to the early production of iron and coal in its mines and ironworks. It got World Heritage status because of the numerous historical buildings in town and its industrial landscape. Ironmaking here was already practised by the Romans. In 1788 the Ironworks were built, using two furnaces blown by one blowing engine. In 1812 they were claimed to be among the most productive in the world. There were many mining pits around Blaenavon. The town is situated on a rim of the South Wales coalfield. The coal initially came from levels and drift mines cut into the hillside which followed the coal seams. In 1800 the first vertical shafts were in operation. A lot more mines followed, especially when the demand for iron rose sharply through the ages. The Big Pit for example opened in 1880. A hundred years later it stopped producing coal, and was turned into a mining museum. Blaenavon is a small town in the green hills of Wales. The surrounding countryside is a great place for hiking. I went to the old coal mine instead, and took the underground tour. The tours at the Big Pit are lead by ex-miners, and take about an hour. Before your visit underground you get a sturdy helmet with a light in front. Off you go then, in the elevator 90 meters downwards. It's dark and cool. Water is dripping. The tunnels you walk in most of the time are just a bit too low to stand upright. March 2018 - Again bad luck. We arrived in the evening. 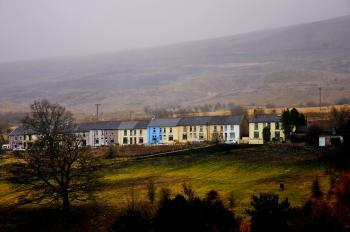 Blaenevon was piled with snow, very wet snow. Somehow we managed to walk through the town and see the WHS buldings. About halfway through my very rainy drive from London to the Blaenavon Industrial Landscape in Wales earlier this month, I had to remind myself BBC weather predicted clearing skies by the time I would arrive at Blaenavon. Fortunately, the weather forecast was correct, and I was able to enjoy some sun for an hour in the town before driving to the Big Pit to descend into the depths of the former coal mine. One of the best things about visiting Blaenavon is that entrance to both the Blaenavon Ironworks and the Big Pit is free, and the former miners giving the tours of the coal mine were knowledgeable and amusing (and good singers, which I suspect is a requirement for being Welsh) as they discussed the hardships of the coal mining industry. On my tour was a friendly Welsh couple who gave context to how the coal mining at Blaenavon benefited the copper industry near their city of Swansea. After touring the Big Pit, I continued to the Ironworks, where I learned the story of Sidney Gilchrist Thomas, who, with his cousin Percy, conducted experiments at Blaenavon in the 1870s and learned how to remove phosphorus from iron to produce steel. While this process was revolutionary, ultimately it led to the rise of the coal and steel industry in mainland Europe at the expense of the industry in Wales. 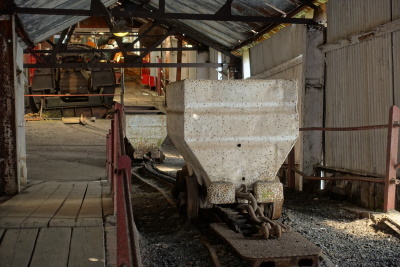 Although not the biggest fan of mines, I learned a lot from my visit to Blaenavon. 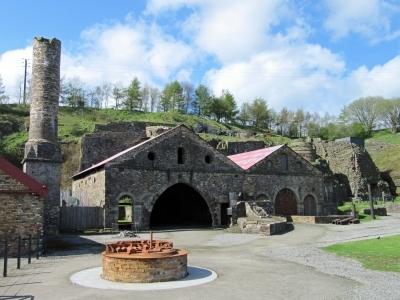 Logistics: Blaenavon is an easy two and a half hour drive from London, and it is relatively easy to walk between the Ironworks and the visitor center in town; the Big Pit can be reached on foot from the Ironworks or faster by car. I visited this WHS in June 2016. The Big Mine has been closed for the last couple of months because of a general strike. Luckily an agreement has been reached and access to the pit should be back to normal soon. However, if you happen to visit on a sunny day I'd suggest you visit the Blaenavon Iron Ore Mountains in the Brecon Beacons National Park from where the iron ore was sourced. The surrounding natural environment has fully recovered and there are several sheep, lambs, badgers, ponds, etc. for an enjoyable hike. Just be careful while driving as you're likely to find sheep crossing the road or just lazing about. 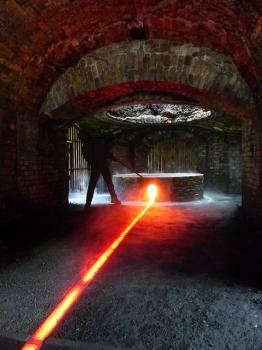 A visit to the Blaenavon Ironworks is a must. Not only because of the official UNESCO plaque (and a beautiful manhole commemorating Blaenavon's inscription in English and Welsh), but also because of the interesting 'vintage-looking' information boards, the museum-like cottages from 1790 to the 20th century and the audiovisual presentation (picture). In brief, the workers prepared coke, Blaenavon rocks or iron ore and limestone in the upper yard above the blast furnaces. Then they tipped them from above and used the engines to blow in air through a network of pipes. At more than 1500 degrees Celsius, the iron melted and the molten iron was 'tapped' and guided into channels in the sand to form iron pigs. The workers then drained the waste slag and transported it away in trams. I was lucky to visit on World Heritage Day and not only was the entrance to the ironworks free but there was also a small fair in town where I bought some lamb pastries. Having visited quite a number of mines, I didn't miss not wearing a hard hat for once but if you have the time or you happen to visit on a wet day, go for it. I went to Blaenavon in June 2013. From Abergavenny station my friend and I took a taxi up the steep steep hill to Blaenavon. The main attraction of the town is the Big Pit mine, which is a former coal mine that operated until 1980. You can go down the pit on a guided tour with a real ex-miner, and it’s all free, so well worth doing. The miners have adapted well to being tour guides, and have a real bonhomie with the visitors. We were given hard hats with headlamps to put on, as well as a belt with a battery and a carbon monoxide safety device. Coming out of the cool, dank mine was a (literal) breath of fresh air, as the weather was unusually – for Wales – warm and the sky blue. After Big Pit we headed off toward the village itself to see the ironworks. We were stopped along our way by the sight of a brewery that had a “self-tour” available, including a sample of ale all for £2.50. At the ironworks they used to smelt the iron ore that was dug out of Big Pit, turning it into useful iron products. The mill employed 5000 people at its peak. Although I'm generally not a big fan of industrial sites, I quite enjoyed my visit to Blaenavon. It is a pretty town in South Wales that can be reached by bus from Newport in about an hour. The main attraction is the Big Pit with the associated National Coal Museum, which was a working coal mine from the mid-19th to the late 20th century. Nowadays, there are very interesting underground tours guided by former miners. 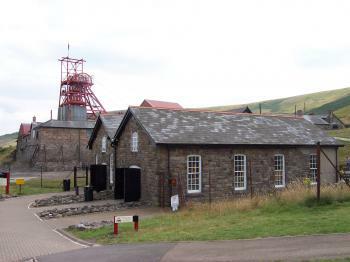 The complex includes several exhibitions about the mines and the often miserable lives of the miners. 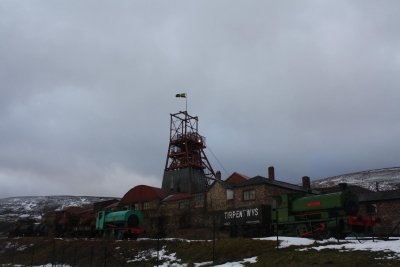 The Big Pit is about a 20-minute walk from the centre of Blaenavon village; attractions in the centre itself include the remains of the ironworks and several historic buildings associated with mining. The best thing is that since the Big Pit is part of the National Museums of Wales, entrance is free. So all in all, it was a very pleasant excursion on a warm summer day. Really sorry for the people of Blaenavon, but for me Blaenavon is become the synonym of one misfortunate after the other in my life as my visit to this place is a collection of unfortunate events. I started my visit on the bright and clear sky day from Bristol, when I reached Newport train station and walked to the bus station, it started to rain and it was really a heavy rain so that the bus diver had to stop the bus for a while as he could not see the road. The driver promised that we will reach Blaenavon as soon as possible, when he resumed the journey in the thick mist. The invisible view along the way was amazing like we drove in the cloud. When the bus reached Blaenavon area, the view was visible again with the stunning rolling hills of green grass which I really enjoyed, but suddenly the bus parked again as there was a big funeral procession in front of the church and then it started to rain again, and few minutes later it was snow! I walked in the snow with unprepared cloth aiming to reach Big Pit Mining Museum; however, snow was so heavy that I could not see the way and I urgently need a warm shelter. I ended up at the hotel restaurant and stuck in there with three cups of hot drink for almost three hours. I walked to see the Ironwork and discovered that the place was under snow and the gate was closed. After many unfortunate events I decided I better to return to Bristol, so I walked to the bus stop in the town center which maybe the only part of UNESCO listed area I have been. The sun almost gone when I reached Newport, and again with my silliness, I took a wrong train and ended up in Gloucester before finally could find a right train back to Bristol. I promised to myself that if I have a chance to come to southern Wales again I definitely will try to visit Blaenavon again, but I may have to bring some lucky charms with me. At the ironworks I was fascinated by the tiny cottages that had been restored in Stack Square and Engine Row. Nearby are the giant smelters where the ore was converted into metal and waste. I managed to fit this in to a long day trip with breakfast at Stonehenge, lunch in Bath and getting to Bleanavon for the last tour of the day! Bleanavon makes a lot out of its UNESCO status there were banners all through the town and it was nice to see as many places in Britain don't make much of a big deal of it! But there is a fair bit to see here the main site "Big Pit" is interesting as you get to go into the mines with the people that used to work there as your guide. There seems to be a really community feeling to the valleys of South Wales, and it was not a surprise to find that the whole thing is free!!! Especially in an area of Britain where Socialist morals were once so strong. I visited Blaenavon's Big Pit on a school trip. I found it very interesting to actually see what it was like for miners when they had to work in the dark, damp and dusty environment. We had to go underground in a sort of cage lift. At one piont we had to turn off our lights, it was pitch black!!! Children had to work in these conditions every single day for upto around ten hours. i just wouldn't have coped. Any way it is a very memorable experience and you should vist it yourself (if you haven't already! )have fun!!!! Elevators: To descend the "Big Pit"
Scientific Developments: Blaenavon Ironworks is where Percy Gilchrist and Sidney Gilchrist Thomas created a process to remove phosphorus from iron ore to make a stronger steel. This revolutionized the steel industry in Europe.